SARASOTA – The Sarasota Bay Estuary Program (SBEP) and the City of Sarasota have installed a living shoreline area at Bay Front Park in downtown Sarasota. The project features 150-feet of Florida-native plants. The use of plants will help stabilize the sediments and provide habitat that attract birds and other wildlife. Living shorelines provide a natural alternative to hardened seawalls made of concrete, rock and other materials. The use of plants and sloping shorelines provides a buffer for stormwater pollution running into local waterways. The Southwest Florida Water Management District provided funding support for the new project and Stantec is the contractor. 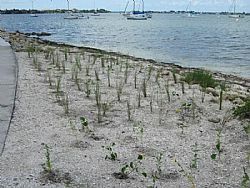 SBEP and its partners completed the region's first living shoreline project in 2011 at Herb Dolan Park in Bradenton Beach. Concrete rubble was removed from the site and replaced with natural fiber material and native vegetation. The SBEP website provides more information about living shorelines.